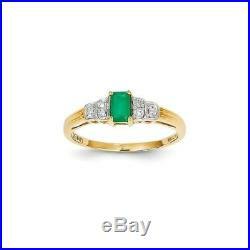 Genuine 14k Yellow Gold Emerald and Diamond Ring 1.78 gr. Trusted Fine Jewelry Retailer Since 1995. Amore La Vita Charms. Coin Jewelry and Bezels. Genuine 14k Yellow Gold Emerald and Diamond Ring 1.78 gr Our Genuine 14k Gold Rings are made of the finest quality 14k Gold. Simple and fashionable, they are just right for everyday wear or for that special occasion. They also make a perfect gift for yourself or someone you love. Since Jewelry is a very personal item, sometimes you just need to see it in person before you know it’s right for you. Once you are certain you like it, you can then have it sized or engraved locally. Please Note: Any ring that has been sized, engraved, or changed in any way, is non-returnable. 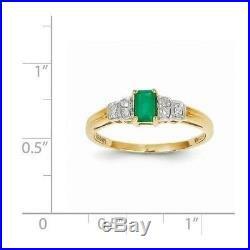 Standard size of this ring: Size 7 (can be sized 2 sizes up or down) Average Gold Weight: 1.78 gr (each ring may vary slightly) Metal Composition: 14k Yellow Gold Attributes: Polished 14k Yellow gold Diamond Emerald Other Specs. Stone 1: Creation Method. 5 x 3 mm. Stone 2: Creation Method. We recommend you have it re-sized locally after you see the ring in person and are certain you like it. Once a ring is sized or changed in any way, it is not returnable. Our Guarantee to You. Sign up to our newsletter for special deals. The item “Genuine 14k Yellow Gold Emerald and Diamond Ring 1.78 gr” is in sale since Sunday, March 06, 2016. This item is in the category “Jewelry & Watches\Fine Jewelry\Fine Rings\Gemstone”. The seller is “jewelrystoresnetwork” and is located in Overland Park, Kansas. This item can be shipped to United States, Canada, United Kingdom, Denmark, Romania, Slovakia, Bulgaria, Czech republic, Finland, Hungary, Latvia, Lithuania, Malta, Estonia, Australia, Greece, Portugal, Cyprus, Slovenia, Japan, Sweden, South Korea, Indonesia, Taiwan, South africa, Thailand, Belgium, France, Hong Kong, Ireland, Netherlands, Poland, Spain, Italy, Germany, Austria, Russian federation, Israel, Mexico, New Zealand, Philippines, Singapore, Norway, Saudi arabia, United arab emirates, Qatar, Kuwait, Bahrain, Croatia, Malaysia, Brazil, Chile, Colombia, Costa rica, Antigua and barbuda, Aruba, Belize, Dominica, Grenada, Saint kitts and nevis, Saint lucia, Montserrat, Turks and caicos islands, Barbados, Bangladesh, Bermuda, Brunei darussalam, Bolivia, Ecuador, Egypt, French guiana, Guernsey, Gibraltar, Guadeloupe, Iceland, Jersey, Jordan, Cambodia, Cayman islands, Liechtenstein, Sri lanka, Luxembourg, Monaco, Macao, Martinique, Maldives, Nicaragua, Oman, Peru, Pakistan, Paraguay, Reunion.